I've been thinking about things players might encounter in the wilderness that are interesting, memorable, but not necessarily hazardous. Basically, the cool things that make you want to be a tourist, but kicked up a fantasy notch. So I thought I'd pick something I'd love seeing from the real world and then give some fantasy idea that is similar. 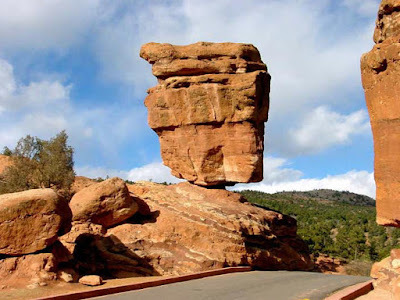 So, for the first installment, that old standby, the balancing rock. This one is from Garden of the Gods, Colorado (cool name, huh?). Your lost, hungry characters, on seeing this, will know exactly where they are and how to get home. In a fantasy world, what if there was a cave or lair in a balancing rock? A nest on top of it? Or, better yet, the balancing rock is so big, a forgotten city is carved right in the side of it and that is where the adventure will take place! Used to live in Colorado Springs and it seemed like we visited GotG a million times. Cool. Is it as impressive in real life as in the photo? Yeah, it's very cool. The whole park is pretty awesome. The balancing rock is the iconic image that everyone knows, but the entire area is filled with all sorts of red rock formations and stuff to climb on and explore. I've run a few road races through there, and it's very challenging terrain to run on, even on paved roads. I can see D&D gamers digging the place just for the inspirational scenery. Now that you've posted this and got me thinking, I might have to dig up some photos and do a post about that. 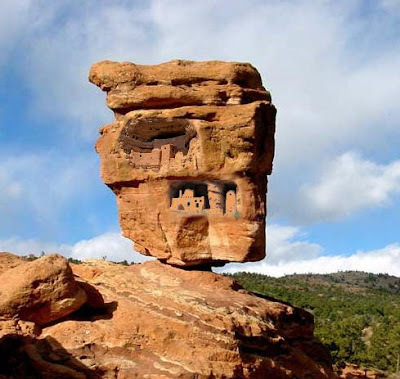 BTW, the city in the rock pic is awesome. Did you make that? Thanks. Yeah, my Gimp-fu is not very strong, but I'm learning.